“If you’re caught on a golf course during a storm and are afraid of lightning, hold up a one-iron. Not even God can hit a one-iron”. The height above sea level used as the reference point or standard, also known as elevation. When altitude changes, air pressure changes. At higher altitudes, air pressure drops reducing lift and drag thereby increasing the golf balls carry. Is the weight of air exerted on the Earth’s surface. The earth is covered by a layer of air (Atmosphere) and this layer is not consistent in density. Parts will have thicker air and that means higher pressure in that area. Note the higher the altitude or elevation the thinner the air and more ball carry. A high-pressure system that moves in a clockwise direction in the Northern Hemisphere and counter clockwise in the Southern Hemisphere. Effects include the clearing of skies and cooler, drier air. An instrument that measures air pressure. The same as Atmospheric pressure, Is the force per unit area exerted on a surface by the weight of air above that surface in the Earths. A temperature scale in which zero° is the freezing point of water and one hundred° is the boiling point of water. Cloudy is when more than 60 percent of the skyline is covered with clouds. No clouds in the sky. The best golfing weather according to golf weather. A slim or narrow zone that separate’s advancing colder air from retreating warm air. Air behind a cold front is cooler and fundamentally drier than the air it is replacing. Cold fronts are usually followed by bands of precipitation along the leading edge of the cold front. These bands of precipitation can bring rain and thunderstorms. The change of water vapour into liquid water, when dew or fog forms. Water that forms on objects close to the ground when the temperature drops below the dew point of the surface air. : The temperature at which air must be cooled for water vapour to condense to form fog or clouds. The higher the dew point, the more the moisture present in the air. Or low pressure area is where the atmospheric pressure is lower than that of surrounding locations. Low clouds and precipitation are side effects. Very small water droplets (less than 0.5 mm in diameter) that fall close to one another. Or Altitude, the height above a fixed reference point (the earth’s sea level). When the elevation or altitude changes - air pressure varies. At higher elevations, air pressure drops ultimately increasing the golf balls carry. The process of a liquid changing into a vapour or gas. One of two standard scales used to measure temperature on GolfWeather.com. In this case the freezing point of water is 32 degrees and the boiling point is 212 degrees. Water that has condensed close to the ground, producing a cloud of very small droplets that decrease visibility. Happens when the temperature falls below 32 degrees. The altitude in the atmosphere where the temperature drops to below 32F. Ice crystals that form on a surface when the air temperature drops below freezing point, the water vapour in the air freezes. Continuous wind speeds ranging from 34 to 47 knots (39 to 54 mph). The theory that increased concentrations of greenhouse gases are causing the Earth’s temperature to dramatically rise. Shallow fog on the ground that reduces visibility. Also known as radiation fog. Liquid and frozen precipitation that has gathered in strong updrafts of thunderstorms to create falling oval shaped lumps of ice. A period of irregularly hot weather lasting several days. The amount of water vapour (moisture) in the air. Less air density (humidity) yields less lift and drag thus in more dense or humid conditions distance will be affected. A spiralling mass of cool, dry air that should bring fair weather and light winds. When viewed from above, winds spiral out of a high-pressure centre in a clockwise rotation in the Northern Hemisphere. Rain that stops and starts repeatedly, not as abrupt or as frequent as showers. A unit of speed equal to one nautical mile or Kilometre per hour (1.15 miles per hour or 1.852 km ). The angular North / South distance measured in degrees along a meridian of the earth's equator. Visible electrical discharges caused by thunderstorms. Note of the golf clubs rules and procedures and warning sirens during such electrical storms. A geographic co-ordinate in degrees that specifies the east-west position of the Greenwich meridian. A increasing mass of warm, moist air that generally brings stormy and windy weather conditions. The highest temperature during an indicated time. The lowest temperature during an indicated time. Water droplets so small that they don’t fall; it appears they are floating in the air. Mist is a lesser type of fog. Widespread cloud cover. There may be thin or bright spots in the cloud, but no openings. Water in any shape or form that falls from the clouds. Including rain, drizzle, hail, snow and sleet. Dew, frost and fog are not considered forms of precipitation. Lliquid water droplets that fall from the atmosphere (clouds), generally having diameters of more than drizzle (0.5 mm). Rain will have an effect / resistance on a golf balls distance. An instrument used to measure rainfall. Measured in Inches or Millimetres. The amount of water vapour in the air, compared to the amount the air could hold if it was entirely saturated. This is expressed as a percentage. The pressure value obtained by the theoretical reduction or increase of barometric pressure to sea-level. Rain falling from the sky causing puddles. Air that is colder than its surroundings and is unaffected to upward movement. Unpleasant weather. Rain, freezing rain, thunder, lightning, snow, hail and sleet. Few clouds, less than half the sky. Frozen precipitation made of ice particles in complex hexagonal patterns. Through the direct conversion of water vapour into ice in cold clouds. The measurement of how hot or cold something is. 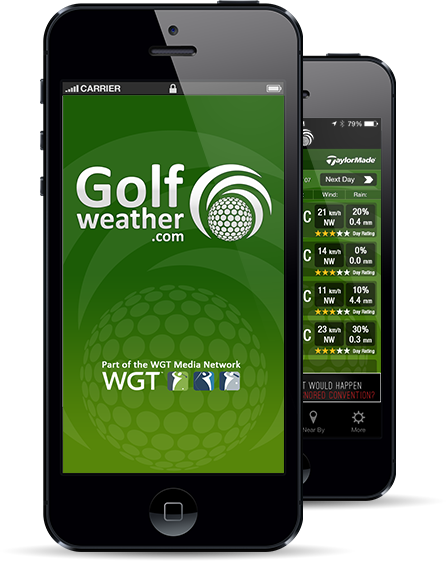 In Golfweather’s case °F and °C are used. Temperature affects both the golf ball’s trajectory and responsiveness at impact. Cold weather will lead to less ball speed. Warmer temperatures and lower humidity lead to more distance. The fiery sound of air expanding as it is heated by lightning. A storm produced by a cumulonimbus cloud with lightning and thunder. Rain, hail and high winds may be additional constituents. An elongated area of low pressure and sustained winds are indicative. Air that easily rises and can lead to the formation of clouds and rain. More than 7° C or 44.6° F below normal. More than 7° C or 44.6° F above normal. The maximum distance that is possible for a person to see with their eyes. Fog reduces visibility. 4°-7° C or 39.2°- 44.6°F above normal. Moving Air. Wind tends to accentuate the features of the golf ball flight. Hitting into the wind will increase drag and lift, leading to a “ballooning” ball flight and loss of distance. When hitting with the wind, drag and lift are decreased, thereby increased distance. 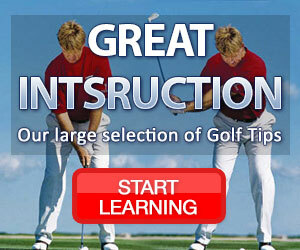 Slice and draw shaped golf shots will also be accentuated. The cooling effect resulting from wind blowing on bare skin. Wind chill is based on the rate of heat loss from exposed skin caused by the combined effects of wind and cold. The number that expresses the cooling effect of moving air at different temperatures. Air temperature and wind speed are used in this calculation. Be Safe in Lightning and Thunderstorms, especially when you are on the Golf Course! Check the Forecast and Watch the Weather: Be aware of developing storms and changing weather. 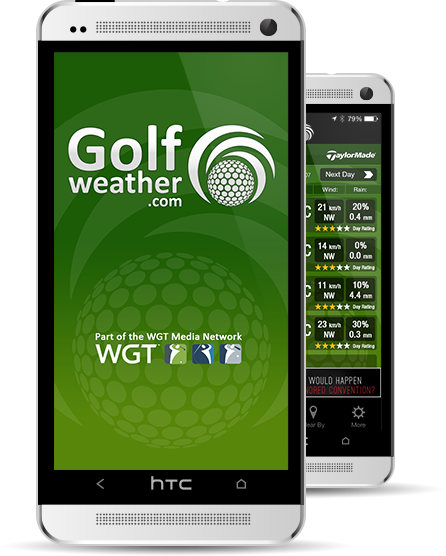 Golfweather.com was created for this purpose. Be Aware of Thunderstorm Hazards: Severe thunderstorms can produce dangerous winds, hail, lightning and flash flooding on the course near streams and lakes etc. Determine how far or how frequent the lighting is: This means that you should take shelter if the time between a lightning flash and the thunder is 30 seconds or less, which means that the lightning is about 8 km / 5 miles away. To determine the distance, count the seconds between the flash and the thunder and divide by 5. As a precaution, don't resume your golf game until 30 minutes after you hear the last thunder. Indoor Lightning Safety while in the club house: Stay away from windows, electrical equipment, and metal objects. You are welcome to huddle around the bar. Outdoor Lightning Safety: Seek shelter indoors or in a car. Stay away from single tall objects such as a tree and metal objects such as fences, metal benches, metal shelters etc. Don't hold golf clubs! Remove your golf bag from your shoulder. It is not safe to be riding golf carts either. If you are out in the open and cannot get to shelter, stand in a low spot under a group of trees, not under a lone tree or crouch down on the balls of your feet—do not lie flat on the ground.